I haven’t been to Craven Cottage and I’m very glad that I did not choose today to change that. Unfortunately for them a strong contingent of Spurs fans made the trip across London and made a better fist of it than the players being extremely vocal throughout the game. It was probably all there was to do as we threw ourselves wholeheartedly into the worst Spurs display for many months leaving Harry looking very hot under the collar as he chose his steps carefully back across the pitch to issue (hopefully) the rollocking of all rollickings to those gathered in the dressing room. Quite what the problem was is hard to tell but both teams carried on from the last time we met with Fulham getting much better and Spurs getting much worse! Over confidence? Complacency? The thought of a home draw after coming through this match? The year ending in 1? Whatever it was it gripped them all at the start, none more so than Michael Dawson who firstly played a suicide pass to Alan Hutton before allowing himself to be blocked off in the chase back and then giving away a second penalty and getting himself sent off for tugging a shirt after 14 minutes. Hutton’s challenge which conceded the first penalty looked unfortunate in real time but he never got any the ball and clipped his man so a fair decision. Quite whether Dawson should have gone for the second is debateable. I felt it harsh but the way he was playing Phil Dowd clearly felt sorry for him and allowed him to sneak off quickly to the Cottage changing rooms. But it was not just Dawson who was having a mare. Over the 90 minutes we hardly had an attack and one shot I recall was from a Van Der Vaart free kick near the half way line. Not the right decision though the keeper was a shade of his line but Rafa could only see two men ahead of him and both were short and useless in the air. Fulham were good – of that there is no doubt but when they got the team sheets they probably felt we can get a “Lancashire performance” out of this lot if we get into them early. The midfield we presented was Lennon on the left, Rafa out right with Pienaar, Sandro and Modric in the centre. Time and time again we feel we can go into these games in all out attack mode but once we get put onto the back foot there is never any answer to it. Sparky’s job was easy, “The only real tackler is the boy Sandro and he has no experience of our game.” I know I’ve complained about Jenas on this blog but this year he has looked better and his experience was vital to compete and take the sting out of Murphy and Dempsey in the early stages. So we lost that battle and inside 45 minutes the war. What made it worse was that Sandro was them removed to allow Gallas to come on. Let’s understand this. Sandro plays for the defensive midfield role – or that was my understanding – and then gets taken off after 17 minutes. In the past Lennon or Modric would have gone, personally I think it should have been Pienaar. He’s new to the club and it could have been justified. Easy for me to say after the game but I thought he showed little and will only be a squad player as he offers nothing over Bale or the others. Many will look at the absence of Bale but that wasn’t it. He would have helped as he has been able to assist in back tracking but he would not have got the ball enough to make a difference. Added to that he played in games where we did give away goals for fun before recovering. So looking at our team – and squad – what we can see is that it’s OK when things are going well but when things go wrong the personnel are sadly lacking in breaking up play and taking the steam out of the opposition. There are exceptions. Gallas – but he was on the bench, Dawson – who went Hari Kari today and Palacios but he cannot keep it when he’s got it. Once again Crouch was called upon to try and resurrect the failures of the first half and Rafa limped off when it was clear it was game over. So it appears we have problems with a day to go in the transfer window. Or do we? Juvenile football says you play your strongest team, win the game and then make changes. Why don’t we do that? Lennon’s started right all season so why start left today. Switch by all means but start? 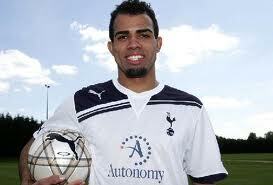 Sandro is in his first season so why put him in as he is clearly not ready yet. Why rest Gallas if we want to win the competition and we needed a different strategy up front. When first signed Rafa was arriving in the box and scoring these days he is pressed back against the half way line leaving us with no support in the box. Bad day at the office? Bloody bad day at the office if truth be told. No new striker on the horizon and only loan deals for those leaving. This was a competition we had a decent chance of winning. Unfortunately we thought we already had or at least for the first 14 minutes.